The heart is the most important organ in your Greyhound’s body. It pumps blood containing oxygen and nutrients through the blood vessels to the cells of the body. Most heart conditions involve decrease in the effective pumping of blood, which can lead to a build-up of fluid in the chest and abdomen. Two main types of heart conditions are one affecting the heart valves (Chronic Valvular Disease) and one affecting the heart muscle (Myocardial Disease). Greyhounds with either type can be successfully managed through nutrition, exercise and medication, if necessary. Chronic Valvular Disease involves a leaking heart valve which reduces the quantity of blood that can be pumped around the body. This condition is more common in dogs. In Myocardial Disease, weakness or thickening of the heart muscle results in the heart pumping less efficiently. This condition is more common in cats. Dental disease, obesity and advanced age are risk factors for heart disease. Certain breeds are predisposed to heart conditions. In dogs, Chronic Valvular Disease is more common in small breeds. Myocardial Disease is more common in large breeds and shorthair breeds. A heart condition may not be obvious in the early states. Consult your veterinarian if have questions. Arthritis is the general term for abnormal changes in a joint. Such changes occur when cartilage is worn away faster than it can be replaced. Cartilage acts as a cushion to protect the bones. When cartilage wears away, joints can become swollen and painful. Arthritis is not curable but it can be treated. As Greyhounds get older, cartilage begins to degenerate. Large breeds are more prone to this condition. Weight gain puts extra stress on the joints which can also lead to arthritis. In addition, joints can deteriorate as a result of stress or trauma caused by accident. Occasionally, because of congenital defects, some dogs are born with arthritis, and sometimes destruction of joint tissue and cartilage is caused by infection. Some arthritis symptoms are similar to symptoms of other serious conditions. Consult your vet if you notice any of these signs. Joint supplements such as Glucosamine and Chondroitin with MSM (a pain reliever) are frequently used for older Greyhounds. Check with your vet to determine the dosage for your pet. Kidneys are important because they remove waste from the blood and maintain the normal balance of fluid and minerals in the body. Any condition which damages the kidneys is referred to as kidney disease. 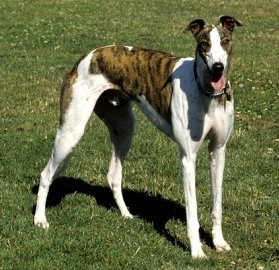 However, blood work in Greyhounds is read differently than for other breeds. Be sure to ask your vet to refer to the article about Greyhound blood work on this site. Sometimes pets may show early warning signs of kidney disease. However, signs of serious illness only show up when three-fourths of the kidneys’ function has already been lost. Early detection blood test is, therefore, important, especially for pets 7 years or older. Kidneys may be damaged by a variety of conditions, including injury, cancer and infection. This damage is usually irreversible. Of course, the above signs may be signals of other conditions. The liver has many important functions, including the digestions and conversion of nutrients, the removal of toxic substances from the blood and storage of vitamins and minerals. Liver disease results in inflammation, known as hepatitis. If not treated, this can lead to loss of function as healthy liver cells are replaced with scar tissue. Diseases in other parts of the body can also affect liver function. Fortunately, liver disease can sometimes be managed and progression limited. Factors that contribute to liver disease of your pet are age, breed (Dobermans, Rottweilers, Yorkies, Cocker Spaniels are more prone to develop liver problems) and medications containing acetaminophen. The signs of liver disease are not very specific, making it more difficult to recognize. If your Greyhound is not eating, consult your vet. Protein: High quality protein provides the building blocks to repair damaged skin. Feeding some unique protein sources, such as venison or duck, can also help reduce reactions in pets with a food allergy or intolerance to more common ingredients. Fatty Acids: A diet containing high levels of omega-3 and omega-6 fatty acids, found naturally in fish oil, may help nourish and protect your pet’s skin and prevent dryness. This may also help control inflammation and itchiness. Antioxidants: Vitamin E and other antioxidants are vital in helping maintain your dog’s healthy immune system and protect it from cellular oxidation caused by free radicals. Any adverse reaction to food may be dietary sensitivity. Food allergies and food intolerance are the two main types of dietary sensitivity. Not all reactions to food are allergies. Allergies may be life-long so the ingredient must be permanently removed from the dog’s diet. Some pets may be unable to tolerate certain foods. Even though the pet may build up a tolerance, it is best to avoid the offending ingredient. Causes of dietary sensitivity may be food allergies (most common being beef, milk, wheat); damage from inflammation, infection, surgery and some medications; age (food intolerance more common in younger dogs and food allergies more common in adult pets); and breed (West Highland White Terriers, Cocker Spaniels and Irish Setters). Similar to Dietary Sensitivity are Digestive Disorders. These are common and most clear up within a few days. However, some dogs need long-term management of these disorders because they are regular or permanent. Any disorder that reduces the digestion or absorption of food or alters the passage through the digestive tract, is a digestive disorder. Efficient digestion is essential to your Greyhound’s building and repairing tissues and obtaining energy. Causes of digestive disorders can range from eating something other than dog food to allergies, infections or lack of digestive enzymes. Some breeds (Great Danes, German Shepherds, Golden Retrievers and Collies) are more prone to particular digestive problems. You vet can perform tests to ascertain the exact cause of the problem. Common signs of Digestive Disorders range from vomiting or diarrhea, change in appetite, flatulence, blood or mucus in feces, constipation, weight loss and abdominal pain. Check with your vet if you notice any of these symptoms. It can be difficult to keep your pet’s teeth cleaned, especially Greyhounds. (A Greyhound is even pictured on the OraVet brochure and includes a testimonial by a Greyhound owner.) Some research shows that 70% of cats and 80% of dogs develop some signs of dental disease by age two. Problems usually start with sticky plaque buildup that hardens to form tartar. If not removed, this can lead to gingivitis, a painful condition of inflamed gums that may develop into periodontal disease. Pets may then lose teeth and be prone to infections that may affect other organs of the body, such as kidneys, heart valves, etc. Contributing factors to oral health problems are age, breed and food. Soft, sticky foods can lead to a faster buildup of plaque. Feeding crunchy kibble or a raw diet may help, as well as regular teeth brushing. Bad breath (halitosis) may be more serious than just an aesthetic problem. It may be a sign of bacteria attacking your pet’s teeth and gums. Left untreated, periodontal disease may cause changes in your pet’s kidneys, heart and liver. It is important that your vet checks your dog’s teeth each time you make a visit to the vet. In addition to certain food, enzyme chews, oral health products, teeth brushing, having your dog’s teeth professionally cleaned is a must, especially for Greyhounds. This is one thing Greyhound owners should budget into the care of their Greyhounds.